Head coach John Duffy has revealed his King Street Solicitors 19-man squad ahead of Featherstone Rovers’ Good Friday match with Toronto Wolfpack (kick-off 6pm). Misi Taulapapa and Richard Moore come back into contention after serving one-match and four-match suspensions respectively. 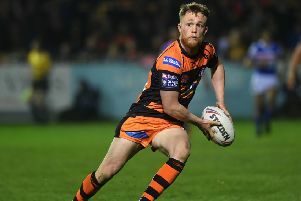 The pair take the places of Jack Ormondroyd and Mitch Clark, who have been recalled for the Easter period by parent clubs Leeds Rhinos and Castleford Tigers. The King Street Solicitors 19-man squad is: Ian Hardman, Shaun Robinson, Misi Taulapapa, Luke Briscoe, Martyn Ridyard, Keal Carlile, Richard Moore, Connor Farrell, John Davies, James Lockwood, Matty Wildie, Gareth Hock, Frankie Mariano, Luke Cooper, Tom Holmes, Josh Hardcastle, Bradley Knowles, Sam Brooks, Harry Newman. Supporters can save £2 on adult and concession admission prices by securing tickets before 5pm tomorrow. Tickets can be purchased by calling 01977 702386 or by visiting the Rovers Superstore - and are priced at £18 (adults), £13 (concessions) and £5 (juniors).